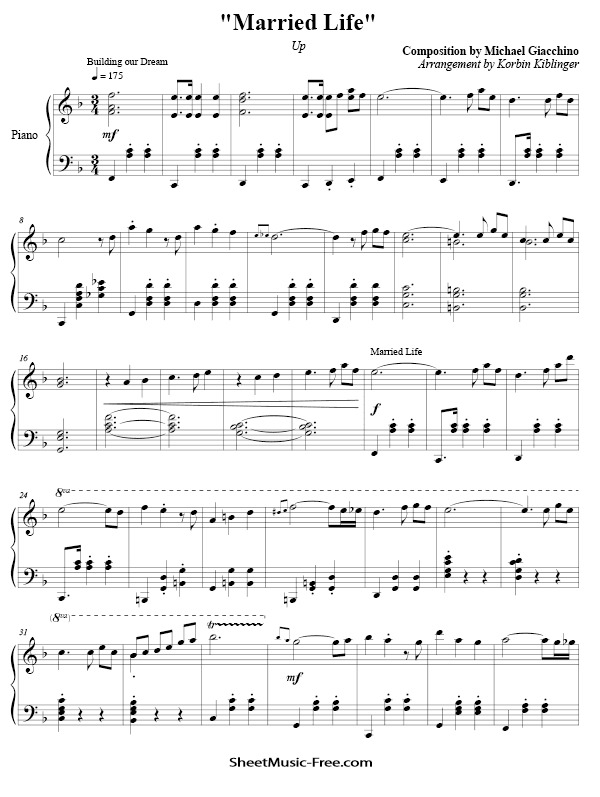 “Married Life Sheet Music” by Michael Giacchino (UP Soundtrack), “ Married Life Sheet Music” for Piano / Original key: F Major, number of pages sheet music PDF: 5, Video song and Video Piano Cover Married Life Sheet Music. “Married Life Sheet Music’” Up is the original score album, featured on the 2009 film of the same name composed by Michael Giacchino. This is his third feature film for Pixar after The Incredibles and Ratatouille. Giacchino wrote a character theme-based score that the filmmakers felt enhanced the story of the film. Up received positive reviews from music critics and won major awards. Married Life Sheet Music Michael Giacchino (UP Soundtrack).